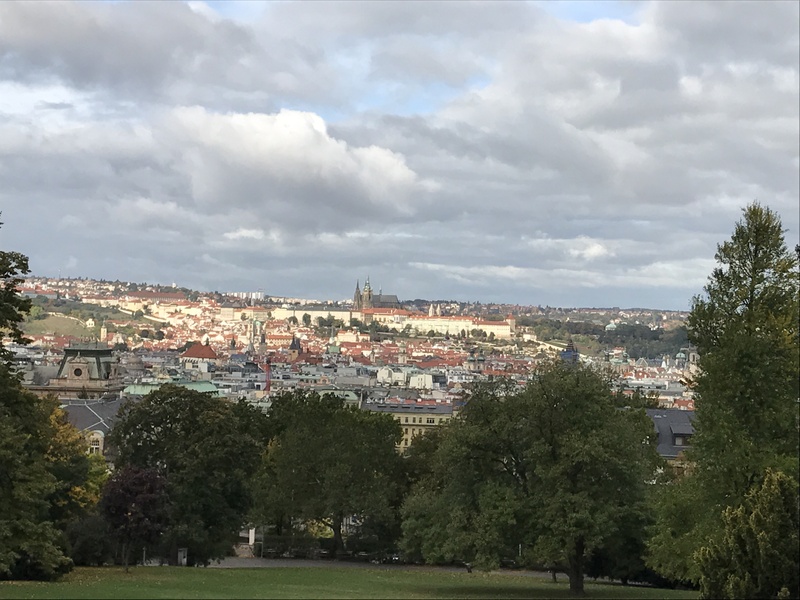 Prague (part 3: luxuries) – record of m.
We were both feeling a little better in the morning, so we ate breakfast and took a long walk around New Town. We didn’t aim to see anything in particular; rather, we just wanted to wander for a while before checking out of our hotel. We’d originally planned to leave and take the train for Cesky Krumlov overnight, and then return to Prague for one last day. But getting sick basically torpedoed that plan. Fortunately, Virginia was able to book a second night at the Augustine, where we already had a reservation for Saturday night. So we left our first hotel and New Town and took the tram to Mala Strana and our new hotel. The Augustine is a new hotel, but a very old building and former monastery. The monks also made St. Thomas beer; after the monastery was converted, the recipe was passed to the hotel and on to Matuška brewery. After unpacking, we walked south along the river through Kampa park to get lunch at Cafe Lounge (another win from the Taste of Prague guide book). After that, we found we were feeling a little better, but not exactly well. So we went back to the hotel to rest for a while. We didn’t have any evening plans, so we decided to basically wing it. First stop: a drink at the Refectory Bar in the hotel, mostly so I could try the St. Thomas beer. (The beer is excellent, though a little expensive by Czech standards. Still, if you’re in Prague, go there and give it a try.) Virginia was done with beer for the trip, so she went with a cocktail. Suitably fortified, we headed out for Lokal to try and get dinner. We then went back to Malostranské Namesti and found a table at Bereda. This turned out to be the only “old Prague” dinner we had: sausage and potatoes with bacon for me; goulash and duck with cabbage for Virginia. Completely stuffed, we called it a night. We managed to get up earlier than we had been because we wanted to get breakfast at Cafe Savoy, and they’re fairly well known to locals and tourists. We got there fairly quickly by tram and managed to beat the rush, waiting only a few minutes before getting seated in their small lofted space. I had fried eggs with ham, and Virginia opted for an omelette with Gruyere cheese, with flat whites for both of us. Through the Rose Garden to the Stefanik Observatory. After breakfast, we decided on a whim that the day was looking nice and we could climb the hill immediately in front of us (Petrin). We walked up about halfway to the midpoint stop for the funicular, and then took the funicular the rest of the way to the top. Once we arrived, we wandered through the Rose Garden and walked past the Stefanik Observatory (because space is freaking awesome everywhere). We also went near the Lookout Tower (basically a mini Eiffel Tower) but chose to steer clear rather than brave the line or the height. We walked back down through the Prague Castle, which was very much taking the long way round. The full-on tourism was almost stifling, so we moved as quickly as we could and got back to Malostranské Namesti so we could get on the tram. We took two trams (transferring at Ujezd) to get to the Karlin neighborhood east of Old Town. I wanted to spend a little time someplace different than where we’d been most of the week. Also, we wanted to return to Eska, the last stop on our food tour the previous Tuesday. In particular, we wanted another dose of their potatoes in ash, served in a creamy kefir sauce with smoked fish and dried egg yolk. We also split a chicken heart/liver soup and traditional sausages with mustard and horseradish, finishing with coffee. Our menu at La Degustation. We walked off all that food by going back through Karlin and Old Town to the hotel. By then it was perhaps 5pm. We rested for a while, listening to music and reading, before getting dressed and going back out for our final dinner of the trip at La Degustation. We finished dinner as midnight approached, and walked back to the hotel. Prague is very safe and we had no problems getting back. Time to go home. We had a few minor hiccups on the way to the airport, but nothing worth remembering in detail. Our flights were uneventful and we were happy to see our home again. Prague, we’ll be back. So sorry that you were both not feeling well on this trip. I do love the picture of you and V together. I’m really glad that you had a good time otherwise. Love you!